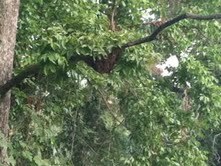 Linda's Bees: Found a Swarm? Call a Beekeeper. We've had quite the warm winter and it's the time of year in Atlanta when bees are swarming every day. It's March 16 as I write this and I know of many, many swarms that have already been reported in Atlanta. Bees swarm in the spring as a way of reproducing the hive. The hive literally splits in half and the old queen leaves with about half the work force - mostly young bees. The bees who have been getting ready to swarm for weeks, have their stomachs full of honey and are ready to relocate. The swarm pours out of the hive in a cloud of what looks like millions of bees but in reality is probably may be about 30,000 bees. The queen lands somewhere and the bees gather around her, clinging to each other in a large cluster. Generally the cluster is hanging from something - a branch, a fence, a gutter, although if the queen doesn't fly well, the cluster may form on the ground. If you see a swarm in your locality - around your house, in your yard, in your neighbor's yard, CALL A BEEKEEPER before you do anything to destroy the bees. Most beekeepers will not collect bees that have been sprayed with insecticide. 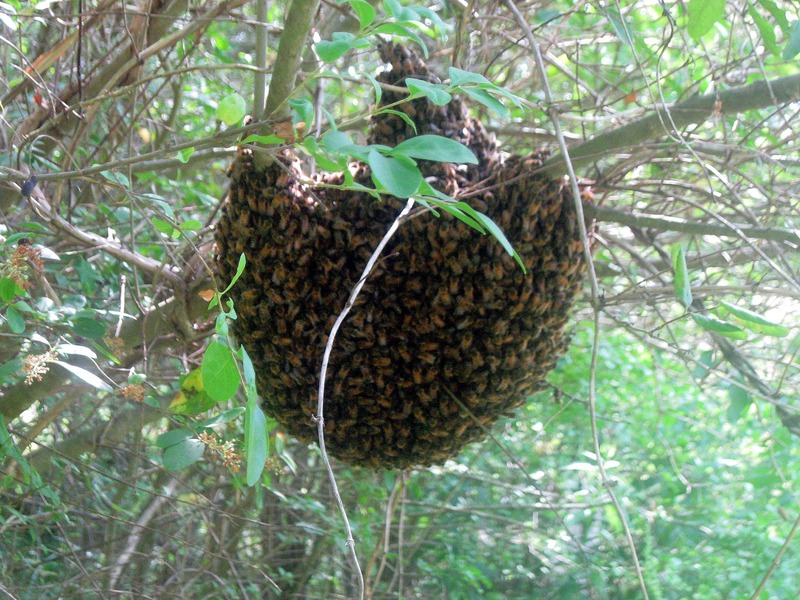 A beekeeper can come collect the swarm and put it in a new, good home. Killing the bees only causes a release of unnecessary poison into the environment. Bees in a swarm are not prone to sting. Their purpose at that time is to find a new home, not to attack you. Also their bellies are full of honey, making it much harder to sting. Generally a swarm hangs in its location only a few days while scout bees go out and find new possibilities for homes - hollow trees, bee boxes, etc. The bees literally vote on which place seems the best to them and when a democratic decision has been reached, the swarm leaves and moves into the new place. So even if you don't call anyone, the bees will leave in a few days. But do call a beekeeper and give the bees an immediate good home. 1. Are these honey bees? 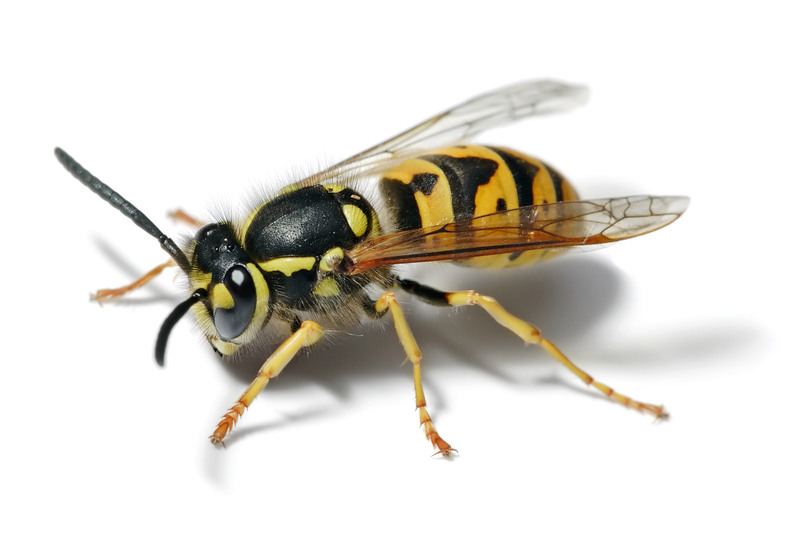 Yellow jackets look like this. You can see that they are mostly black and yellow. Honey bees look like this - they are more brown and orange. 2. How big is the cluster? Is it the size of a baseball? A football? A basketball? 4. How high up is the swarm? 5. When did you first notice the bees? 6. Have you called anyone else to come? 8. Can you send a picture of the swarm from your phone or camera? This swarm was on a shrub and could be collected from the ground. Here's the slide show of collecting this swarm. This swarm in the second photo was high in the tree and required a ladder and a swarm catcher. Here's a swarm on a shrub. Here's a swarm on a fence. We own a nuisance wildlife removal company in the North Atlanta area and if you find you do have bees please,please, please do not use pesticides, bees are way to valuable to kill and many times all you end up doing is pushing them further into the structure costing you more in repairs. Same with yellow jackets you just push them in deeper making our job harder and more costly to remove. If Linda or another bee keeper cant help you for any reason give us a call we have equipment and gear that no bee keeper I have ever met owns helping us to access the problem and determine the scope of the situation. We live in the N. Phoenix, AZ area, we have a small cluster of bees clinging to the NW top corner of our flat roofed home. They were trying to make a nest inside wall, the upper level above the roof line. I don't want to exterminate them, but I don't want them living in our home either. Any suggestions for local bee keepers? I called one place, they want $695 to exterminate them, claiming that all AZ bees are Africanized. I don'r believe that to be true. The bees have not moved since last evening, they are about the size of a 12" piza pie, about 1.5" thick. If you'll look in Google for treatment free beekeepers in Arizona, there are many. However, nobody will typically remove bees from inside your wall for free. Beekeepers typically collect swarms for free, but bee removal from inside a house is difficult to say the least and isn't done for free. I love collecting swarms. If anyone from PA is reading this and you have a swarm, please call me. My number is on my website www.ilovebees.buzz. Hello. I'm not familiar with Bees but we've been talking about getting the bee box because we noticed a huge swarm of bees who can't seem to find a permanent home. For several weeks now we have seen this one around our house. We first noticed it up in a pine tree and it seemed to go away 2 weeks ago. 3 days ago I noticed it had returned and was accumulating in our loquat tree. Within a day it had moved to the fence right below our loquat tree. The last two days this swarm of bees has moved back and forth 3 times in one day. Just now I noticed them swarming up and a Tall Pine Tree and then they all returned to the loquat tree with in 5 mins. I am concerned for them. Is this a common thing for a swarm to do? We have made no attempts disturb them. We would love them to find a home near by and stay! Linda! My family is located in Atlanta, and I'd love to meet you and learn from you if you're open to some light mentoring. I homeschool my children, and we are very interested in learning how to keep bees. Linda! My family recently relocated to Atlanta, and I am very interested in learning how to keep bees. I homeschool my children, and we are looking for some light mentorship. Please let me know if you're available and interested in this, or where else you would suggest I look to get started.